The Monkey King's Garb (Sunwuko) Set Dungeon is located in Act IV, The Pinnacle of Heaven. This is the short area directly preceding the Diablo fight, so you will have to take The Silver Spire Level 2 waypoint and reach its end. Once inside The Pinnacle of Heaven, walk slightly to the left of the entrance and the Sunwuko Set Dungeon will appear if you have the 6-piece set bonus active. The Sunwuko Set Dungeon's two unique Primary Objectives are to: 1) Maintain Sweeping Wind for the duration of the dungeon; and 2) Use your decoys to hit 20 different enemies in 6 seconds. 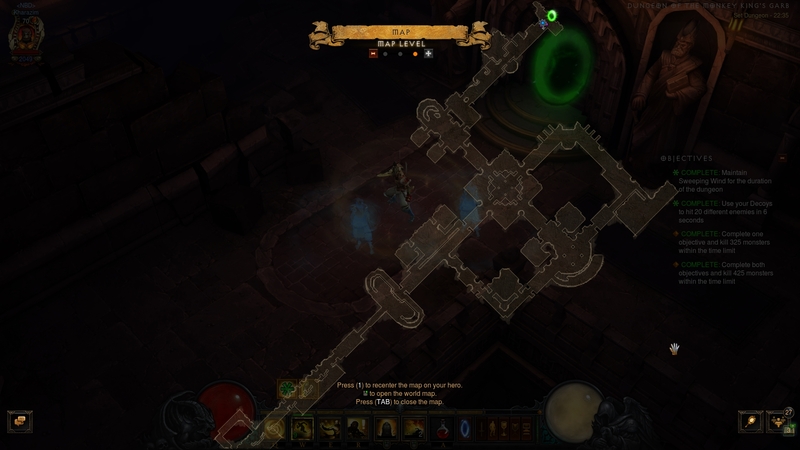 The Sunwuko Set Dungeon is a cathedral tileset with considerable length (its final dead end cannot be captured in a single screenshot, but isn't much further); however it is a simple and straightforward layout. A proven attempt path is to clear the initial L-shaped section, then head north and make the trip through the rectangular section; finally, head down the southern corridor all the way to the end. Bile Crawlers and Spine Lashers — small-sized trash spread in large bulks throughout the dungeon. They will be key to the competion of the 2nd Objective, so try not to oneshot them ahead of time when you notice a pack. Corrupted Angels — stronger melee trash with a charging attack. Monkey Guardians — the unique enemies of the map. They resemble Act 5's Punisher trash, but also have the Mortar and Teleporter affixes. The Sunwuko Set Dungeon is arguably the simplest of the bunch, with simple to execute objectives and no self-inflicted nerfing necessary. Theoretically, there is a chance (due to the long distances covered) that you lose momentum between fights and Sweeping Wind upkeep is threatened. To negate this, simply equip a Kyoshiro's Soul belt, which will maintain the stacks out of combat. You will have plenty of trash to do the 2nd Objective with, just practice some restraint with Wave of Light and group enemies up with Cyclone Strike repeatedly. Since there is no requirement to hit the enemies at once (instead, it's a generous 6-second period), you can chain a few small fights with Cyclone Strikes and get the Objective done easily. Overall, this Set Dungeon should not take more than 1-2 attempts.